Comedy is featured in four one-act plays on stage at Mississippi College. 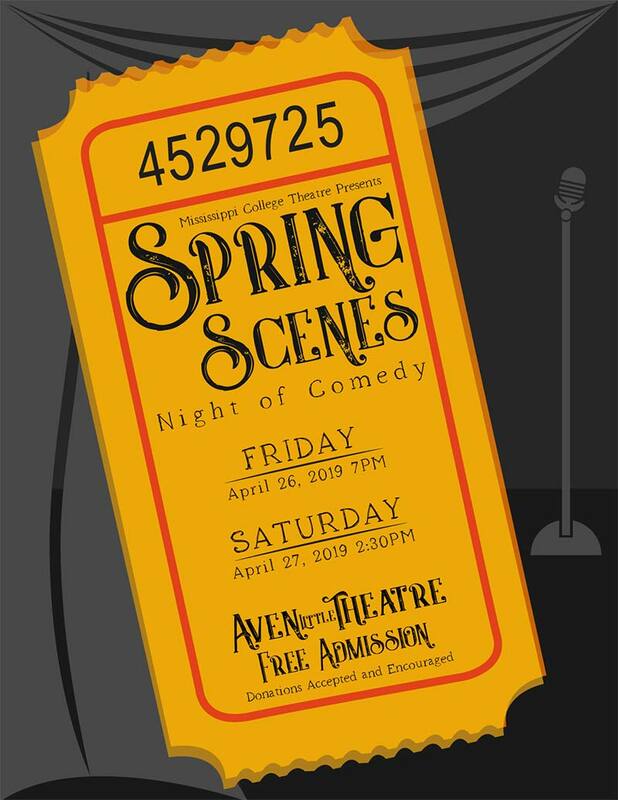 And what’s fantastic is that admission is free to “Spring Scenes” performances on the Clinton campus. The public is invited to attend the April 26-27 productions at the Aven Little Theater. The Mississippi College Theatre presents the shows beginning 7 p.m. that Friday and 2:30 p.m. that Saturday. While there’s no admission charge, donations will be accepted at the door. The cozy venue is located in the basement of the Aven Fine Arts Building. “Family Separation” is the name of the dark comedy skit with parents (Andrew & Andrea) separating from their kids (Fran & Francis). The one-act was penned by Peter Keel. “Dis-Harmony Commercial,” is the title of the funny production barely lasting two minutes. It tells the story of Neal Down, founder of the on-line dating website Dis-Harmony.com. Lois and Kelly Corcoran teamed up to write this one loaded with laughs. And there’s more on stage to come that Spring weekend, says Mississippi College student Destiny York, who’s promoting the plays. “101 Ways to Dump Someone in Five Minutes” is the one-act that reveals to audiences how getting rid of certain people is accomplished very quickly. The play’s writer is Damien Darr. He’s among several authors associated with Off The Wall Plays. Lois and Kelly Corcoran are some of the other writers. Finally, there’s an amusing tale centered around someone found dead after being stabbed in the back. Who did the awful crime? It is billed as a funny whodunit. The play’s title is “Who…You…Me…Someone,” by Christopher Conners, Jr. The New Jersey-based playwright penned short plays as a student at Syracuse University in New York. He’s also linked to the creative writers with Off the Wall Plays. Audiences should arrive early for “Spring Scenes” productions, says communication professor Phyllis Seawright. Seating is limited in the tiny theater, she noted. The Aven Little Theater seats up to 110 people. It thrives as a black box-style theater with a superb workshop atmosphere. Each year, the Mississippi College productions receive the enthusiastic support of students, faculty, staff and the metro Jackson community.